The online advertising arena is just about to get a lot more interesting. In an announcement made Thursday on the Inside AdWords blog, Google says it is launching a new type of online advertising that will appear in its search results – called Product Listing Ads. While Google’s text-only search ads – AdWords – have served as its bread and butter for awhile now, Product Listing Ads work slightly differently. First, they’re a lot more visual: advertisers can now list specific products with accompanying images/pictures, instead of just lines of text (“Sponsored Links”) that are placed next to the search results that are based on the keywords that people enter into their search queries. According to Google, people are twice as likely to click on these image-based ads as they are to click on the usual text ads in the same location of a results page. Product Listing Ads can also include merchant name and price of the product. Moreover, for the first time ever, advertisers won’t have to “pay per click” (PPC). They will have to pay only when a person buys the search-advertised product. We can call this new scheme “pay-per-purchase” or “cost-per-action”. Another significant difference of Google’s new Product Listing Ads from standard text ads is that these new advertisements automatically show up whenever a person’s search query matches an item in the advertiser’s Merchant Center account. This means that Product Listing Ads do not require keywords or ad text (research for which, one must admit, can be downright painful); Google will instead be the one to choose which ads are shown based on the advertiser’s product inventory and on its relevance to the search query. 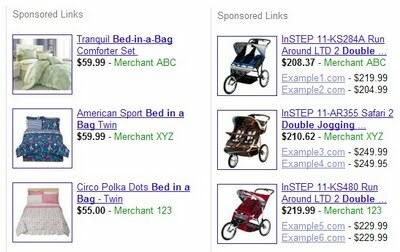 Google says that Product Listing Ads are still a beta feature, available only to a limited number of retail advertisers. Over time, however, the company will increase the number of users who see Product Listing Ads as well as the number of advertisers who are able to participate. Great write up. I’m currently testing this for 3 clients. Seems like a dynamite way to get clicks. However, what about conversion rate? Google doesn’t mention that. I’m keeping a close eye on CR. It concerns me that we can’t show text and product ads – mainly my product ads have been trumping my text ad impression share. Any feedback would be great. Happy bidding! It would be to get your feedback after the holidays to see how your clients performed on this performance ad plan. Let us know! My findings were pretty scattered. I had to pause the PLAs after only a week of testing due to a drop in conversion rate. I saw a pretty dramatic cannibalization of my text ads and a dip in overall CR and CTR. Unfortunately it was during the holiday season so I had to maintain a high ROI for my client. I will be testing this more in the next month or so. Hopefully by then there will be more data from other users available. I really can’t agree with all of their findings. This has to vary client to client. And I think feed optimization will play a big part in the success of your PLA campaign. Turning it on across the board isn’t a solid plan. I’ve worked with a couple clients who are currently implementing this and, they love it. One customer, who sells flags on his store was achieving 7% conversion rates, while the rest of his account of normal text ads was at 2%. This is a great future for online stores, but when it comes to mass produced products that are the same from every vendor. It could become very difficult to differentiate why they should purchase the product from you. Makes your product image that much more important, since it will be seen as the entry point to your site. So people who resell products, you better start taking your own pictures of your products. Great article, thanks for sharing this information.